Egypt’s Desert Dreams: Development or Disaster? The maquette offered no escape. 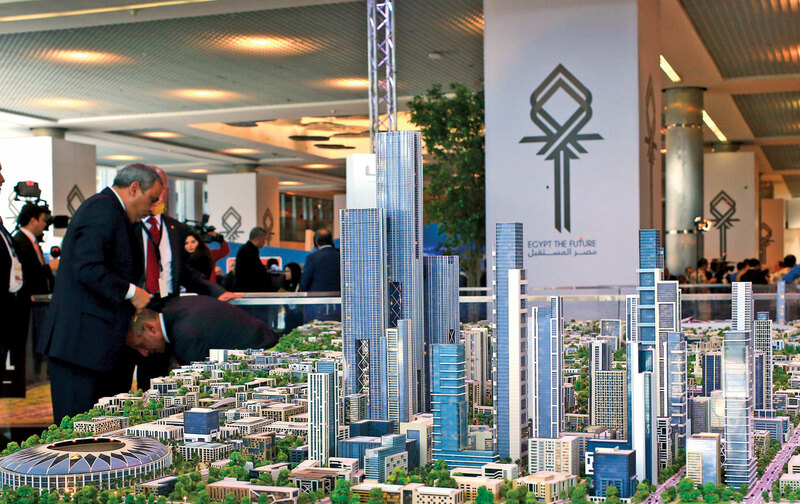 It was unveiled at an international investor conference in the Red Sea resort town of Sharm el-Sheikh, where—amid speeches by various Persian Gulf monarchs promising billions to Egypt—the organizers promoted the sprawling model of a new capital city, complete with a high-rise downtown skyline punctuated by the giant obelisk of a skyscraper. If its working name, “The Capital Cairo,” was vague, the promotional material was outlandishly precise: The new capital, situated on a stretch of desert east of Cairo, halfway to the Suez Canal and past New Cairo (just the most recent in a string of failed satellite cities to pop up around Cairo since the late 1970s), would supposedly include 21 residential neighborhoods, 40,000 hotel rooms, 663 hospitals and clinics, 700 kindergartens, 1,250 mosques and churches, 1.5 square miles of theme parks, a park twice the size of Central Park, and 1.1 million homes for at least 5 million people. Estimated to cost either $45 billion or $80 billion (the government couldn’t get its story straight), New New Cairo would be the size of Singapore. Although Egypt’s strongman, the general turned president Abdel Fattah el-Sisi, presented this fantasy as his own, the brawn behind the plan is Capital City Partners, a self-described “private real estate investment fund by global investors focused on investment and development partnerships in high-growth international markets.” It’s run by the Emirati real-estate tycoon Mohamed Alabbar, the founder of Emaar Properties, one of the largest real-estate companies in the world, which built the Burj Khalifa—the world’s tallest building—and much else in Dubai’s construction spree, from the Dubai Mall (also one of the world’s largest) to the Dubai Marina, an artificial waterfront district that is home to a thicket of high-rise residential towers. Alabbar, as his biography on the Capital City Partners website proudly proclaims, has also devised outsize urban plans for other Arab countries, most notably King Abdullah Economic City in Saudi Arabia, billed as “one of the largest private-sector developments in the Middle East.” You couldn’t find a better champion of privatized urbanism in the Arab world than Alabbar, who has amassed a real-estate portfolio in Egypt worth almost $7 billion. Much like Mubarak—and, indeed, like Morsi—Abdel Fattah el-Sisi has made real estate, and especially gulf-investor funding, the object of his desire. There is no shortage of reminders that Sisi’s regime is a return to—if not worse than—that of Hosni Mubarak, which came to an end after 18 days of popular protest in February 2011. Many of the uprising’s activists languish in jail, in nominal violation of a harsh new law against “unlicensed” public protests. More than 41,000 Egyptians have been arrested and jailed during Sisi’s crackdown, which has targeted mostly Islamists but also journalists, students, and any other brave critics. In May, Mohamed Morsi, the Muslim Brotherhood–aligned elected president whom Sisi ousted in a 2013 coup, was sentenced to death. Meanwhile, the convictions against the 87-year-old Mubarak have been systematically overturned. The ex-president is now living in a cushy military hospital awaiting retrial, even as his sons, his former internal-security chief, and various other officials and regime cronies have been released from prison. With dissent quashed, Sisi moved on to the next phase, which was what the investment conference in Sharm el-Sheikh was all about: showing that Egypt is open for business, and also to giving special privileges to gulf magnates like Alabbar. Sisi has pinned most of his ideas for economic growth on the sort of grand projects and overblown development plans—including an expansion of the Suez Canal, recently completed—that Egyptian leaders since Gamal Abdel Nasser in the 1950s have used to establish their legitimacy. But much like Mubarak—and, indeed, like Morsi—the president has made real estate, and especially gulf-investor funding, the object of his desire. Sisi’s New New Cairo couldn’t have made that any clearer. Few observers of Egypt’s political and economic milieu are better suited to comment on Sisi’s capital fantasia than David Sims, an economist and urban planner who has worked in the country since 1974. His 2010 book, Understanding Cairo: The Logic of a City Out of Control, is the definitive account of the Egyptian capital’s recent history and, since it was published just before the 2011 uprising, of the role that urban planning played in Mubarak’s rotten regime. The former autocrat mismanaged and neglected Cairo, a city of some 18 million people: His fixation was selling tracts of state-owned desert land on the city’s periphery to crony speculators in sweetheart deals that fueled rampant corruption and led to the proliferation of half-built and sparsely occupied compounds with names like New Giza and Uptown Cairo. The latter is on a choice stretch of land atop the Moqattam Hills overlooking central Cairo; the army, which owned the land, sold it to Uptown Cairo’s developer—none other than Emaar—under a suspiciously noncompetitive bid. Sims’s well-timed new book, Egypt’s Desert Dreams, amounts to an extensive indictment of Sisi’s development plans—and the Capital Cairo isn’t the only one. During the presidential campaign, Sisi promised 26 “new integrated tourist towns,” eight new airports, three new seaports, a free-trade zone, and a new industrial city in northern Sinai, along with over 4 million acres of desert land “reclaimed” for agricultural use. This makes him only the latest in a string of Egyptian leaders to hitch his political and economic agenda to half-baked development plans. This sad history stretches from the so-called reclamation projects—most notoriously Toshka, a massive Mubarak-era scheme to siphon water from Lake Nasser in order to turn a huge swath of the Sahara north of Sudan into another Nile Valley—to the many ghost towns on Cairo’s edges, to the countless resorts on Egypt’s once-pristine Red Sea and Mediterranean beaches. Successive governments have used desert development (whether housing, agriculture, industry, or tourism) as a false promise, a distraction, and a piggy bank, all while ignoring the majority of Egyptians and depriving them of necessary resources. Yet despite this government neglect, the vast majority of Egyptians still live in the dense cities, towns, and villages of the Nile Valley. While the government sees this density as a problem, Sims says that it actually has many advantages, if only the planners would notice them, including close transportation links and proximity to various kinds of employment, and especially the intricate family and job networks through which most Egyptians support themselves. Cairo is within a three-hour drive for over two-thirds of Egypt’s 88 million people—five, if you take various kinds of formal or informal public transportation. Whereas the story of Cairo’s mismanagement and malfeasance is often told anecdotally and without much skepticism or clarity, Egypt’s Desert Dreams is a well-organized story with an abundance of detail. That’s no small feat when crunching Egyptian census figures and tracking the country’s byzantine bureaucracy. Consider the following: Since the 1970s, the Ministry of Housing in Cairo has variously included “reconstruction,” “development,” “new communities,” and “utilities” in its title—but at the same time, it shouldn’t be confused with the New Urban Communities Authority (NUCA), the National Center for Planning of State Land Uses (NCPSLU), the General Organization for Physical Planning (GOPP), or the General Authority for Reclamation Projects and Agricultural Development (GARPAD), even though their remits often overlap, and it isn’t always clear who has authority over whom or what. Drawing on extensive research and Google satellite images, Sims navigates the ins and outs of desert agriculture and mining plans and exposes the proliferation of government-built “new towns” and private desert compounds across Egypt, which have done little more than enrich their developers. Seen from a satellite, many of these projects look like sad imitations of Robert Smithson’s built environments: an agglomeration of winding, half-paved roads, sketchy cul-de-sacs and drab, New Urbanism–inspired subdivisions, still awaiting buildings—and people—and surrounded by desert. Consider the 23 “new towns” that have been built by the government since 1976, when they were launched by then-President Anwar Sadat—mostly around Cairo and Upper Egypt, but also in the Nile Delta and near Alexandria. They were conceived as mass people-moving projects, intended to attract millions from the Nile Valley into residential life in the desert. NUCA, the unaccountable planning authority behind these towns, has always overestimated its population targets. Using census figures, Sims estimates that NUCA’s total target population for the towns was more than 20.5 million people; in reality, they are home to a little over 783,000—just 3.8 percent of that unreal target number. NUCA promoted the towns as job engines too, much as the government has done for every other kind of desert project, from industrial parks to “reclaimed” farms and beach resorts. But Sims doubts that all of these projects combined have created more than 1.2 million direct, permanent jobs over the course of half a century. Despite their abject failure, the new towns were built and expanded because the policy behind them, in Sims’s words, has “been steered by an opaque and self-serving dirigiste bureaucracy whose only idea of ‘reform’ is to be ever more beholden to business elites and private capital and whose style is to plunge ahead regardless, converting more and more public land into sterile subdivisions full of ‘dead capital’ that practically no one lives in.” If at first you don’t succeed, try, try again—and so the government has: In the second half of the 20th century, Egypt launched more new cities than any other country on earth. But there’s more to Sisi’s grand projects than a devotion to old, broken development ideas in order to boost his legitimacy and attract crony investment. Sims is right that “the same blind faith in this bankrupt program continues more or less unabated” since Mubarak’s ouster, but there’s arguably something else at play: power politics and the settling of longtime internal regime rivalries, as well as the emergence of new ones. It was widely suspected that Egypt’s generals bristled at the neoliberal economic program accelerated under Mubarak, especially as his son Gamal rose through the ranks of the National Democratic Party (NDP) and was groomed as his heir apparent. It’s not that the generals were necessarily opposed; they have thrived for decades on their own semiprivate economic empire, buttressed by billions in US aid, which the army has used to pay for other perks, including a lavish hospital and a fleet of luxury Gulfstream jets. Rather, the generals were concerned that Gamal and his ilk, with their investment-friendly agenda, would become too much of a rival to—and sap on—their own influence. The generals’ sidelining of certain sectors of the late Mubarak order increasingly looks like its own kind of Corrective Revolution. While acknowledging that “a few generals are rumored to have become rich,” Yezid Sayigh, an expert on the Egyptian military, has argued that its off-the-books businesses guarantee “a separate income stream that is off-limits to government auditors or parliamentary oversight…to ameliorate the impact of a rapidly privatizing economy on the living standards of officers.” This is part of a longer rivalry among the military, the internal-security forces, and political leadership dating back to the Nasser and Sadat eras, and stoked under 30 years of Mubarak—a history that Hazem Kandil outlines in his boldly revisionist Soldiers, Spies and Statesmen: Egypt’s Road to Revolt (2012)—and it may also explain why the generals abandoned Mubarak so quickly during the uprising of 2011. Egypt’s generals have slowly plotted their reformation of the regime ever since, capped by Sisi’s 2013 coup and his election a year later as president. “The Egyptian Armed Forces and the Remaking of an Economic Empire,” a recent report by Shana Marshall for the Car­negie Middle East Center, explores how the army “has gained unprecedented power since overseeing the ouster of two Egyptian presidents” by rebuilding its commercial empire and becoming “the primary gatekeeper for the Egyptian economy.” Marshall stresses that a temporary alliance between the military and the Muslim Brotherhood “broke down” when Morsi “tried to sideline the military on megaprojects such as the Suez Canal development plan and Toshka” (Mubarak’s white elephant in southern Egypt, which Sisi is planning to revive). The groundwork was being laid before Sisi. The country’s Illicit Gains Authority investigated high-profile Mubarak cronies after his ouster but stayed clear of any military interests, because it couldn’t establish jurisdiction over them. Under the Supreme Council of the Armed Forces, which ruled until Morsi’s election in 2012, private-equity firms tied to the army continued sealing millions in new deals, while firms “without a history of doing business with the military”—namely those associated with Gamal—“were less fortunate” and instead got targeted by government auditors. The generals’ sidelining of certain sectors of the late Mubarak order increasingly looks like its own kind of Corrective Revolution (the name that Sadat gave to his 1971 purge of Nasser loyalists); only this one rode in on the back of a popular uprising that the generals turned to their advantage and quickly leveraged into a counterrevolution. One of the landmarks of the 2011 protests is the former headquarters of Mubarak’s NDP, which was torched during the uprising and has existed as a burned-out hulk on the Nile Corniche near Tahrir Square ever since. Gamal had a plush office there. Ahead of the economic conference in Sharm el-Sheikh, Sisi and his generals had the building draped in a giant banner that proclaimed: investment is the key to egypt’s welfare. Soon after, the government announced plans to finally tear the building down. Demolition began in May.